This "tank cleaning" session is routine. A video showing captive dolphins struggling to swim in just a few inches of water at the bottom of a tank is becoming a powerful testament to the inherent deprivations involved in keeping these intelligent animals confined. The footage, which was shot at the Churaumi Aquarium in Okinawa, Japan, shows a routine tank cleaning. During the cleaning process at this and many other aquariums, the dolphins are kept inside the tank as it's slowly drained of water. "The dolphins in these tanks are stranded on the concrete bottom for a period of time during the cleaning. This does not just happen in all the dolphinariums in Japan ... but also happens in aquariums all over the world," Ric O'Barry, founder of Ric O'Barry's Dolphin Project, wrote in October after another disturbing image of one of these cleanings — which showed a dolphin lying on the bottom of a dry tank while workers scrubbed the surroundings — went viral. While bigger aquariums like SeaWorld have holding tanks where their captive animals wait during cleanings, this is still the norm at many smaller aquariums around the world. In the wild, bottlenose dolphins can swim up to 100 miles per day with their pods. They have highly complex relationships with one another and work together to hunt for food. 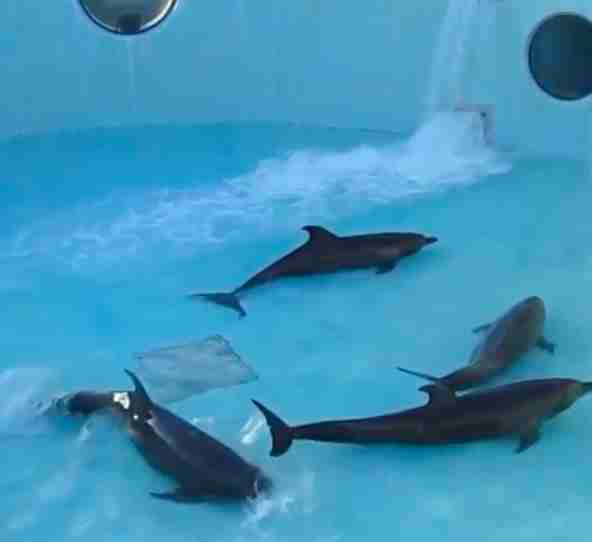 But in the tanks, dolphins are stripped of the ability to act on almost all their natural impulses. Since exposes like "Blackfish" and "The Cove" were released, it's become more and more commonly known that keeping intelligent marine mammals in tanks is depriving them of the things that make their lives meaningful. This becomes even harder to ignore when these tank cleanings — which generally occur at least once a month — show how, as a matter of routine, some of these animals literally have the water drained out from beneath them. "Once the water is drained, you can clearly see that these dolphins are being kept in sterile concrete boxes," O'Barry added. You can help animals kept in tanks by signing a pledge to never buy a ticket to a dolphin show. You can also make a donation to Ric O'Barry's Dolphin Project.